(Fig. 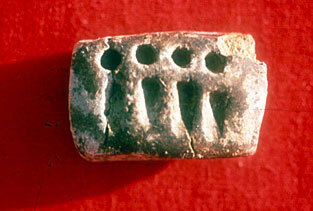 1) Tokens from Tepe Gawra, present day Iraq, ca. 4000 BC.
. cone, sphere, and flat disk are three measures of cereals: small, larger ,largest.
. tetrahedron is a unit of work (one man/one day? ). Courtesy the University Museum, the University of Pennsylvania, Philadelphia. During the Urban Period, 3500-3100, new types of tokens appeared besides the plain ones. Among them were further geometric shapes such as quadrangles, triangles, paraboloids, ovals and biconoids, but also naturalistic forms including vessels, tools and animals. These so-called complex tokens were characteristically covered with lines or dots conferring qualitative information. (fig. 2) Triangles, paraboloids, and mostly disks occurred in series bearing various sets of lines. Plain and complex tokens were found by the dozen or the hundreds in Near Eastern archaeological sites from Palestine to Anatolia and from Syria to Persia. (Fig. 2) Tokens from Tello, ancient Girsu, present day Iraq, ca. 3300 BC. Starting above from left to right : 1 length of textile, one jar of oil, – ? –, one measure of wheat. Continuing below from right to left: one ram, one length of rope, 1 ingot of metal, 1 garment. Courtesy Musee du Louvre, Department des Antiquites Orientales. (Fig. 3) Envelope from Susa, Iran, ca. 3300 BC, The lenticular disks each stand for “a flock” (–10 animals?) . The large cone is a very large measure of grain, the small cones are small measures of grain. Courtesy Musee du Louvre, Department des Antiquites Orientales. 1. Counting – Tokens shed light on the beginning of counting. 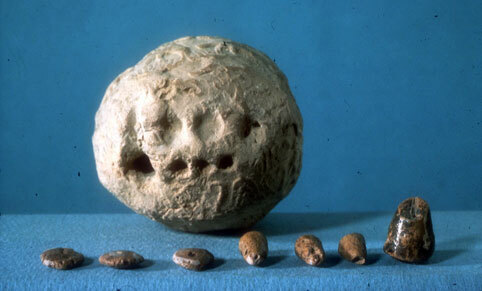 First, the tokens were used in one-to-one correspondence: three jars of oil were shown by three ovoid tokens, which is the simplest way of reckoning. Second, the fact that each commodity was counted with a specific type of tokens, i.e. jars of oil could only be counted with ovoid tokens, denotes concrete counting. Concrete counting is characterized by different numerations or different sequences of number words to count different categories of items. 2. Economy – Tokens were linked to the economy. Their invention corresponds to the beginning of agriculture. For example, at Mureybet, Syria, tokens occur in level III, where pollen indicated the presence of cultivated fields. (Cauvin, 74) Second, the counters served exclusively to keep track of commodities. The plain tokens stood for farm products: small and large cones, spheres and flat disks stood for different measures of barley; ovoids for jars of oil; cylinders and lenticular disks represented numbers of domesticated animals and tetrahedrons for units of labor. Ca. 3500, the proliferation of token shapes and markings reflected the multiplication of commodities manufactured in urban workshops. Triangular shapes stood for ingots of metal; series of disks bearing on their face various numbers of parallel lines stood for various qualities of textiles and paraboloids for garments. 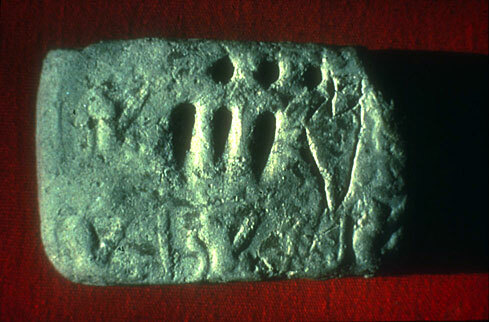 Quantities of beer, oil, honey were shown by tokens in the shape of their usual containers. There is no evidence that tokens were used for trade. Instead they were central to administration. 3. Administration – The mastery of counting and accounting with tokens fostered an elite based on administrative skills, who controlled the redistribution economy. The main function of tokens was to keep track of household and workshop contributions of surplus goods to the communal wealth and their redistribution for the support of the underprivileged or the organization of religious festivals. The bullae and envelopes with their multiple office seals illustrate the toughening of the city state administrations, when unpaid contributions were recorded until their settlement. 4. Cognition – Counting with tokens reflected the level of cognition of preliterate oral cultures. (Malafouris) Data processing with tokens was tactile. The counters were meant to be grasped and manipulated with the fingers. Addition, subtraction, multiplication and division of quantities of commodities were done by moving or removing counters by hand. Tokens processed data concretely. First, the items counted consisted exclusively of goods, such as barley, animals and oil. Second, plurality was treated concretely, in one-to-one correspondence and with concrete numerations. (Fig. 4) Impressed tablet from Godin Tepe, Iran, ca. 3100 BC. courtesy Cuyler Young Jr., Royal Ontario Museum, Toronto. The small circular signs stand for 1 large measure of grain, the wedges for a small measure of grain. Writing inherited from tokens a system for accounting goods, clay, and a repertory of signs. Writing brought abstraction to data processing: the signs abstracting tokens were no longer tangible; abstract numerals such as “1” “10” “60” replaced one-to-one correspondence; (fig.5) finally, pictographs took phonetic values. (Fig. 5) Incised tablet from Godin Tepe, Iran, ca. 3100 BC. courtesy Cuyler Young Jr., Royal Ontario Museum, Toronto. The incised sign stands for a jar of oil, the circular signs stand for 10, the wedges for 1 = 33 jars of oil. 7. Significance – Tokens played a major role in the development of counting, data processing and communication in the ancient Near East. They made possible the establishment of a Neolithic redistribution economy and thereby set the foundation of the Mesopotamian Bronze Age civilization. 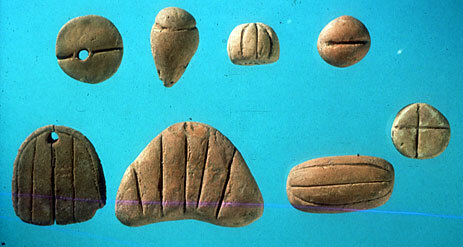 Addison F. (1949) Jebel Moya 1 and 2 – Budja M. (1998) Clay Tokens – Accounting before Writing in Eurasia (Documenta Praehistorica 25) 219-235. Cauvin J. (1978) Les Premiers Villages de Syrie-Palestine du 9ème au 7ème Millénaire, avant J.C. Hang K.X/ Qun Z./and Li X. D. (ed.) (2008) Bengbu Shuangdun 2 – A Report on the Neolithic Site – Jarrige C./ Jarrige J-F./Meadow R./ Quivron G. (ed.) (1995) Mehrgarh, Field Reports 1974-1985. Malafouris L, (2010) Grasping the concept of number: How did the sapient mind move beyond approximation, in: I. Morley/C. Renfrew (ed. ), The Archaeology of Measurement 35 -42. Masson V.M./Sarianidi V.I. (1972) Central Asia.